Itching to get out of the city and explore the great outdoors this weekend (which can actually be a four-day weekend if you took a leave on April 30)? You don't have to venture far. Beside Taal Lake in Talisay, Batangas lies a hidden haven that would be perfect for your barkada or family getaway. You may think you've seen all there is to see of Taal Lake and its famous volcano with your frequent trips to Tagaytay, but did you ever really venture close to the lake shore? 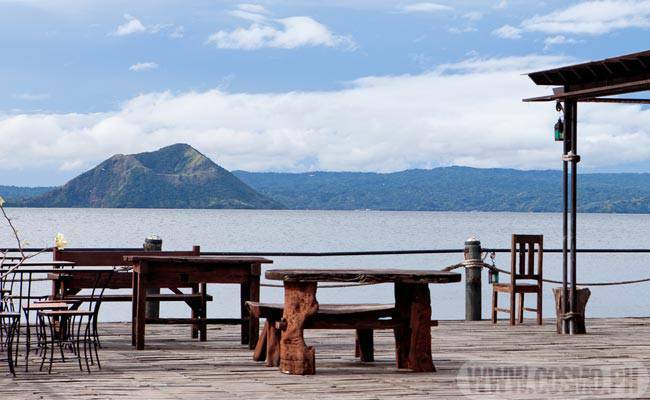 Club Balai Isabel is built along the lake itself and offers an up-close view of the world-famous Taal Volcano that you won't get anywhere else. But, it's not just the view you'll enjoy; there's something for everyone at this resort. Sure you can enjoy the lush greenery and breathe in fresh air at this eco-tourism destination, but you can also trek to the crater on horseback or on foot, as well as engage in water sports like kayaking, sailing, jet skiing, and wakeboarding. You may also rent a boat for site-seeing around the lake, or enjoy outdoor sports like beach volleyball, basketball, tennis, and badminton. It also has three swimming pools and a playground. The residential resort community also boasts of many amenities unique to Balai Isabel, like the Balikatan Obstacle Course, The Spa and Adol Ya Linawa in the Wellness Village, medical facilities at Clinica Manila, the Spousal of Mary & Joseph Chapel and the ruins of a 17th century church, as well as three restaurants where you can enjoy local and international cuisine with a twist: Terraza Restaurant, Isabel Organic Cafe, and Kape Kumintang. Depending on how many you are in the group and what view of the resort you like, you can choose from a wide variety of accommodations. If you're going with a small group, you can rent one of the Lakeside or Lakefront Suites, some of which come with a loft for more bed space. Larger groups and families can stay in their Deluxe Lake Shore Suites and Family Villas. The latter can fit around 10 to 11 people and even has its own pool! So if you want to visit a new resort this weekend or any other weekend this summer, head to Club Balai Isabel and have a relaxing encounter with nature. Launch the gallery to see photos of the resort, and go to the next page to see accommodation rates. Club Balai Isabel is located at Barangay Banga, Talisay, Batangas (facing Taal Volcano). Contact numbers for bookings and reservations: 02-8970229 and 02-8957230 (Makati Office); 043-7280307 and 043-7730004 (Site Office); 0917-5044157 and 0917-872 1512. Visit their website, balaiisabel.com, for more info. *Hotel rooms are inclusive of breakfast. Each person in excess of the regular capacity will be charged P1,500. Strictly no cooking allowed. *Villas and cottages are exclusive of breakfast but occupants have the option to cook. Each person in excess of the regular capacity will be charged P550. Rates are inclusive of applicable government tax and service charge. Room rates are subject to change without prior notice.